It´s an eggplant sort of summer. After tomatoes, eggplant are my go-to fruit/vegetable, day-in and day-out. I’ve prepared them grilled on a wood fire and on a plancha, stewed with other vegetables and chicken in pisto, sandwiched with cheese and fried, stuffed with meat, in a smooth timbale pudding. Even layered with cheese for a microwave eggplant parm. Pickled eggplant fill clay orzas at a market in La Mancha. Picking some very small eggplant in my garden, I suddenly remembered the pickled eggplant that I tasted in La Mancha. 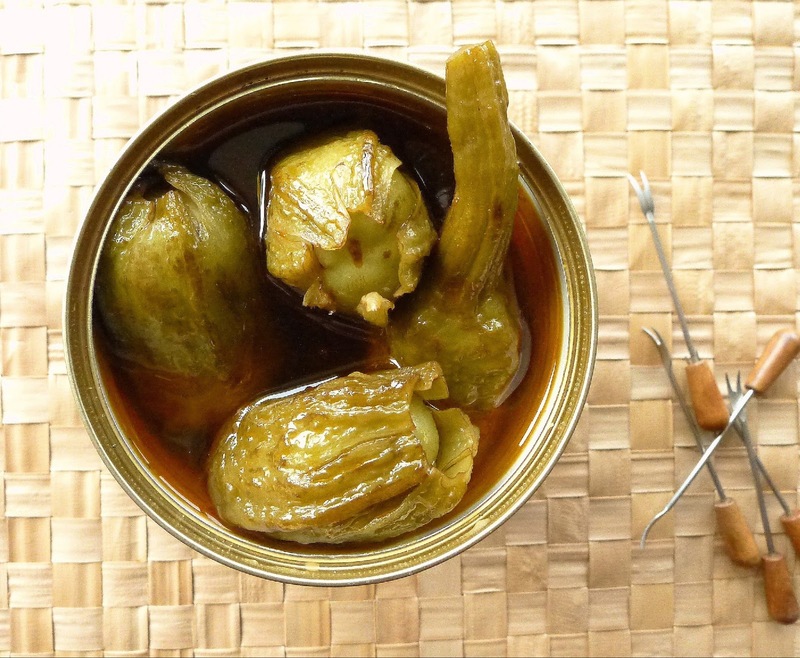 Known as Berenjena de Almagro, they are a very small variety native to the region that are pickled and conserved in big clay orzas, vats. Grown in and around the town of Almagro, in the Campo de Calatrava (Ciudad Real province, La Mancha, central Spain), the eggplant have their own Indicación Geografica Protegida. Almagro is a gem of town, with a Plaza Mayor enclosed by graceful old buildings, one of which houses the Corral de Comedias, a 16th century theater. 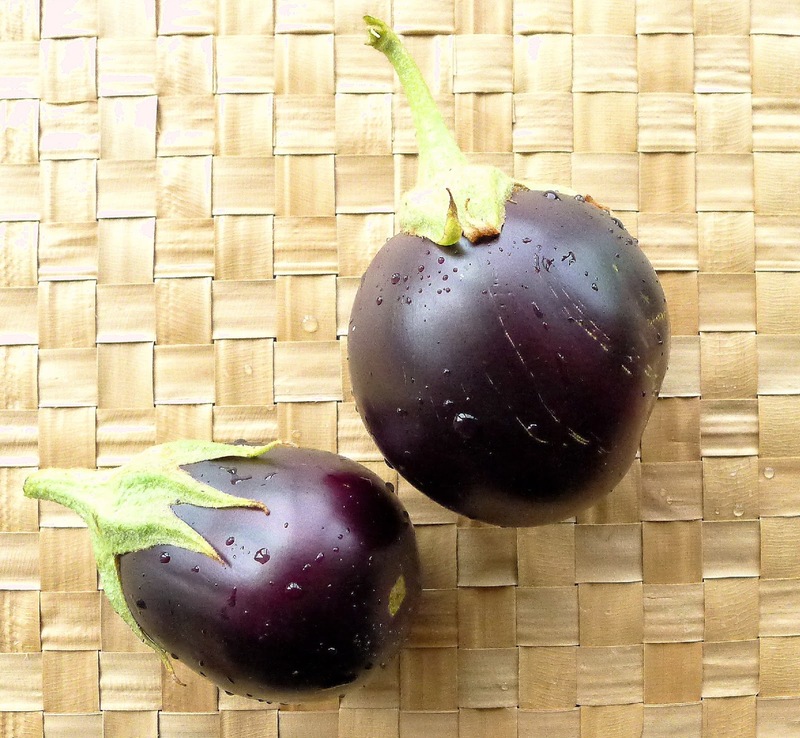 Almagro eggplant are small, egg-shaped and mostly green in color. The famous pickled eggplant are made with tiny (2-3 inch-) round green eggplant. Speared on short lengths of wild fennel, they are prepared whole, with stem and some of calyx attached, or split and stuffed with roasted red pepper. I’ve made this pickle before using wedges of regular eggplant, but decided to try using small, whole ones this time. Mine are not quite as small as the Manchego ones, and definitely purple, not green. They came out just fine. "Official" Almagro eggplant from a can. 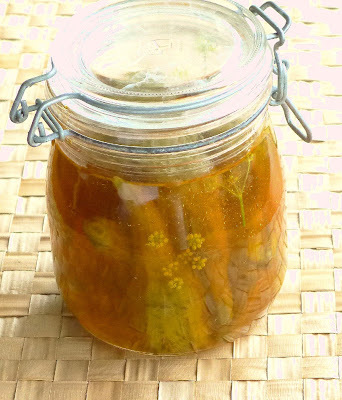 Pickled eggplant from Almagro (La Mancha). Fennel flowers are an optional garnish. 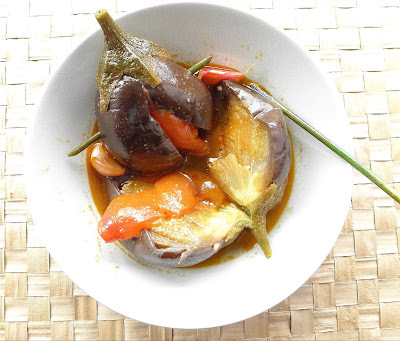 The eggplant are served, like olives, as a tapa. 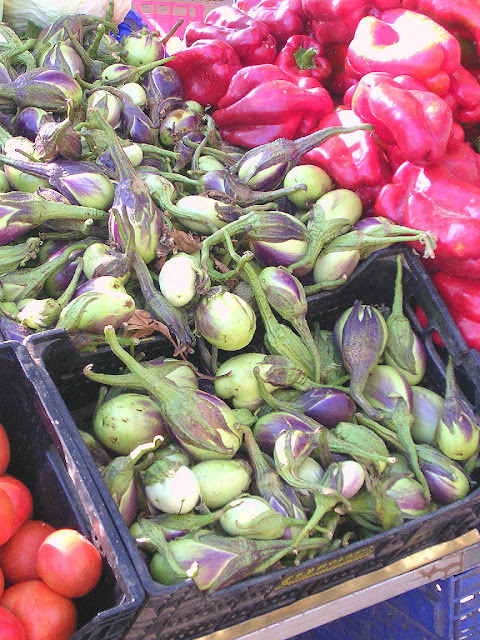 You pick them up by the stem and eat the eggplant nubbin. Due to the vinegar content, they go better with beer than with wine. 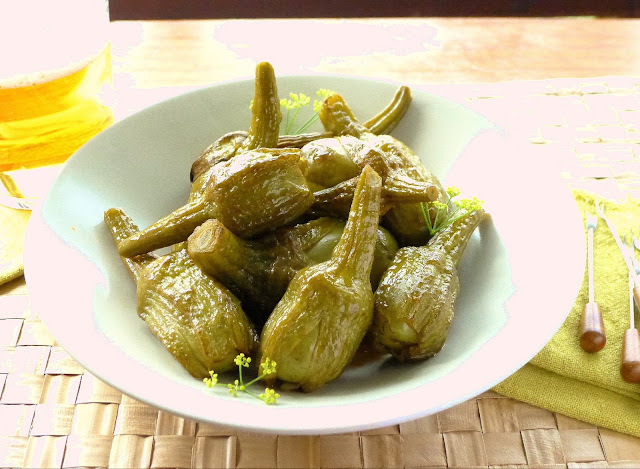 They also make a good relish with grilled or roasted meat and fried foods. I’m going to serve them with a mess of pan-grilled lamb chops. 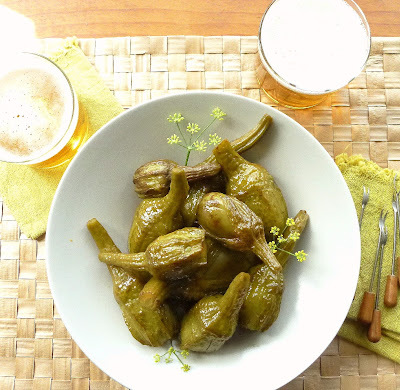 Serve pickled eggplant as a tapa with beer. 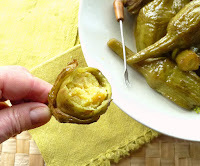 Pickled eggplant embuchadas, stuffed with red pepper and speared with fennel stems. Eggplant from my garden are larger than the ones from Almagro. If you can get it, use the stems of wild fennel to skewer the eggplant. The fennel adds a subtle flavor to the marinade. Otherwise, use short wooden or bamboo skewers. For the roasted red pepper, you can use canned pimiento. Mine are purple, not green. Wash the eggplant well. Trim the stems. Snip off the spiny tips of the leaves, but don’t remove them. Slice the eggplant lengthwise, without cutting all the way through, leaving the two halves attached at the stem end. 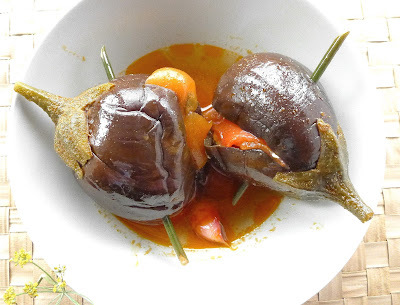 Put the eggplant in a pan of salted water and bring to a boil. Cook the eggplant 10-12 minutes, or until they are just tender when tested with a skewer. Drain and rinse them in cold water. Lightly crush the cloves of garlic, but do not peel them. Place them in a bowl with the pimentón, cumin, fennel seed, if using, oil and 1 tablespoon salt. Add the strips of roasted red pepper and mix. Stuff one or two strips of red pepper into the slits of the eggplant and skewer them closed. Place them in a non-reactive bowl or jar (ceramic or glass). Add the vinegar and water to the remaining garlic-pimentón blend. Pour the marinade over the eggplant. Cover and leave in a cool place for 3 days. They are ready to eat. The eggplant keep, refrigerated, for up to 3 weeks. In a vinegar marinade, the tiny eggplant keep for weeks. I’ve got tomatoes, lots of them! 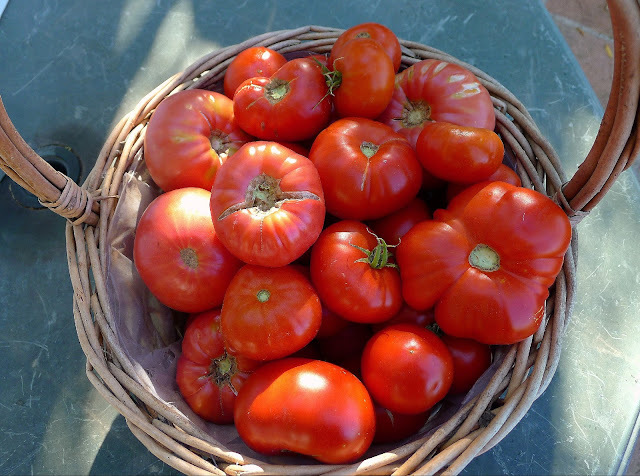 Last summer I saved seeds from the best tasting tomatoes of the season. In the spring, I started several flats of seedlings, more really than I had space for in the garden. When it came time to plant them out, I couldn’t bear to throw out the extras, so we hauled manure and dug up two new garden plots. The plants flourished, in spite of some disease that caused flowers to curl up. 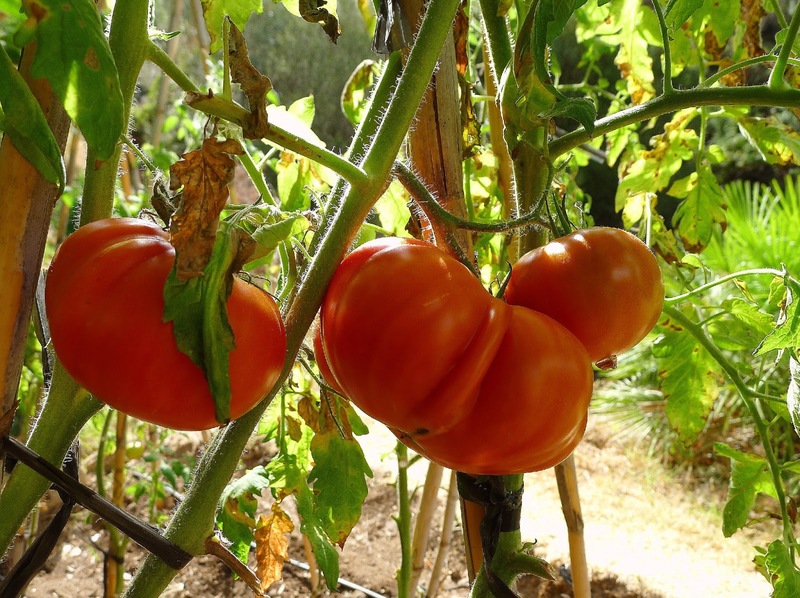 They are not heavy-producing varieties anyway, like some of the commercially-grown ones. But, with an August heat spell, they all started ripening at once. We started picking. I’ve been serving sliced tomatoes for breakfast, lunch and dinner. I’ve made more than a gallon of gazpacho. I cooked up batches of sofrito to freeze. I skinned whole tomatoes and packed them in plastic zip bags for the freezer. Still, the tomatoes keep coming. 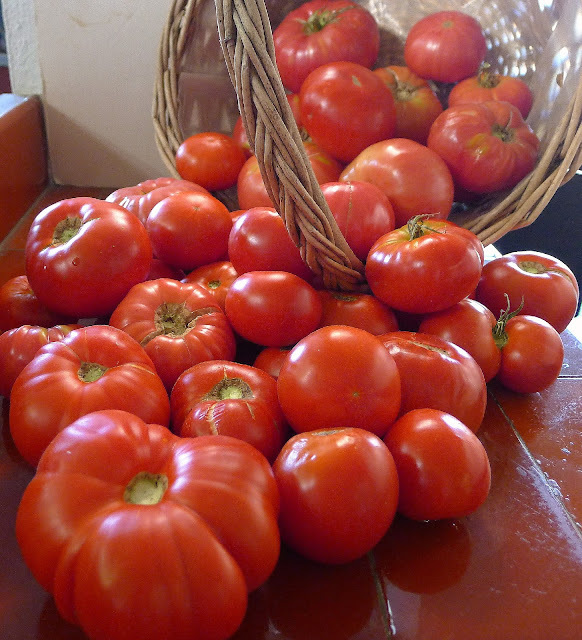 Tomatoes for breakfast: pan con tomate, also known as pan catalán. Scrub a cut tomato on toasted bread (and a cut garlic too, if desired). Drizzle liberally with extra virgin olive oil. 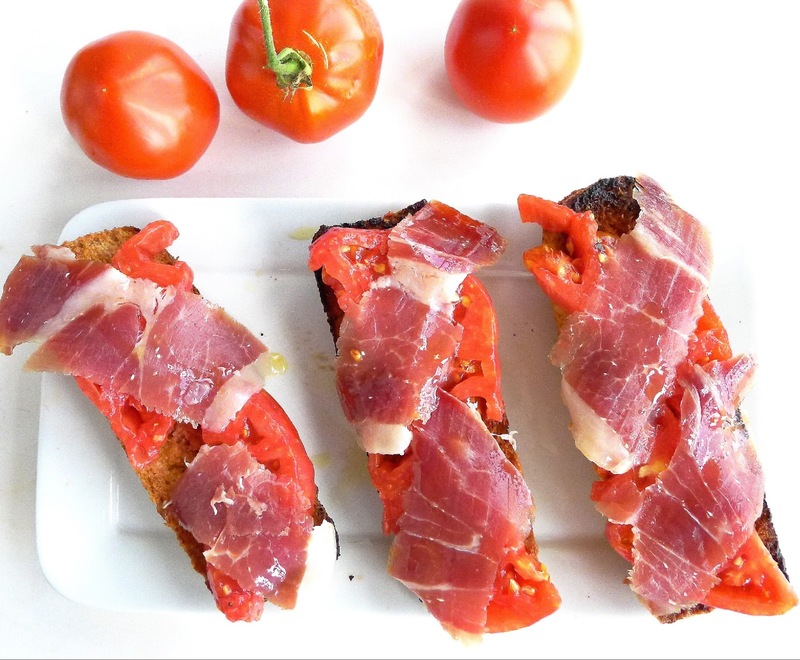 Lay sliced tomatoes on top and cover with thinly sliced serrano ham. Better than a BLT. Tomatoes for lunch: stuffed with rice salad. 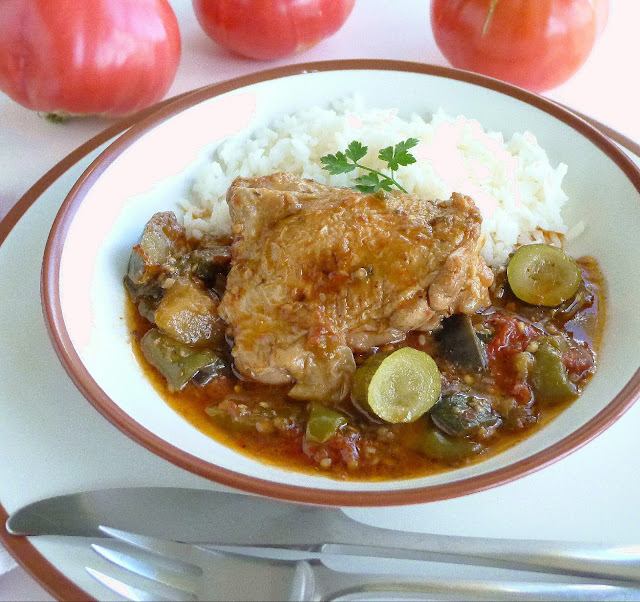 Tomatoes for dinner: tomato-vegetable stew with chicken (pisto con pollo). 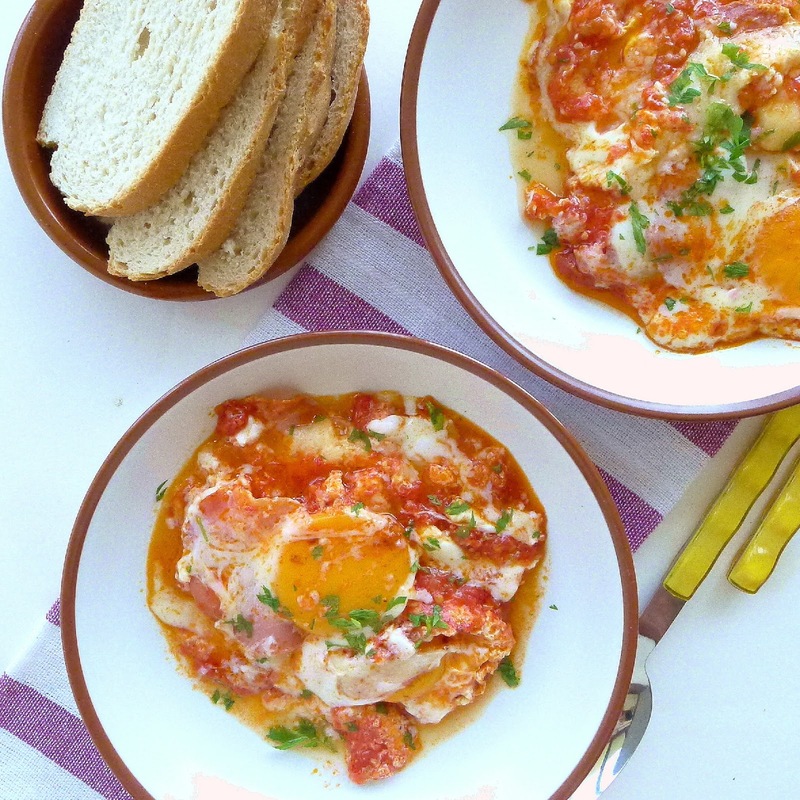 Tomatoes for brunch or supper: eggs poached in tomato puree. 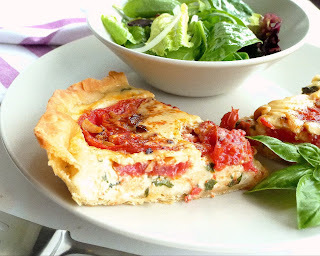 Another tomato tart. I used the leftover dough from the previous tart--pre-baked in a pie pan--and filled it with a quiche-type custard. I quickly fried the tomatoes, so they released some of their juices before hitting the oven, before putting them on top of the custard. For the custard, combine 1 cup grated Manchego cheese, 2 beaten eggs, 1/2 cup cream, 1/4 cup chopped basil and 2 tablespoons minced onion, salt and pepper. Top with sliced tomatoes and bake at 375ºF until set, about 20 minutes. Frozen assets. Many containers of sofrito tomato sauce and bags of whole, skinned tomatoes. I'm growing about four different tomato varieties. Here are two--on the right, huevo de toro, named for a part of a bull's anatomy. They are famous in the Guadalhorce valley (Málaga). These have a thin, pinkish-colored skin and are incredibly meaty and juicy. They didn't survive the 100ºF heat so well. I don't know the name of the red, red ones on the left. 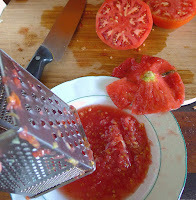 I saved the seeds from some fabulous tomatoes we had from Tarifa. They have leathery skin that is easy to peel off and, probably because of the tough skin, they stand up to the heat really well. I love their flavor, the perfect balance of sweet and tart. 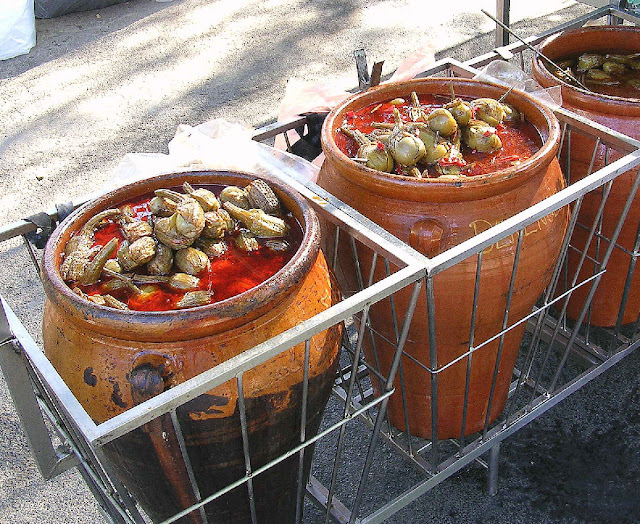 Pisto is the emblematic dish of La Mancha. This version with chicken calls for onions, tomatoes, and peppers, which become both sauce and vegetable side dish. I’ve added zucchini and eggplant from the garden as well. Serve it with bread, rice or noodles to soak up the delicious juices. 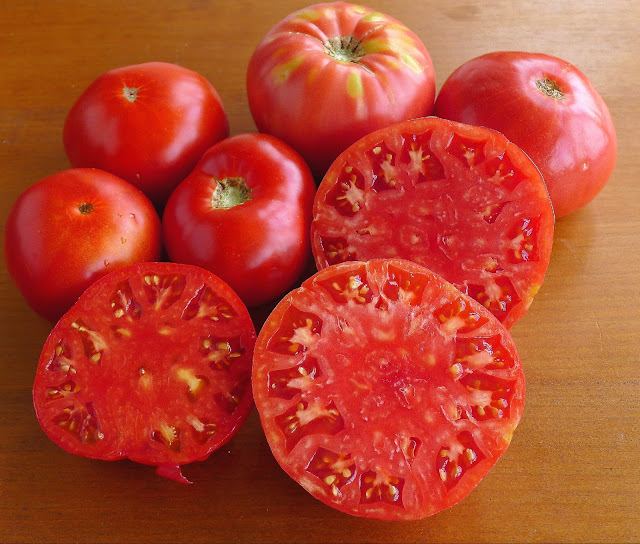 To easily skin tomatoes in quantity: remove stem and core, cut a slash in the skin on the opposite side and drop the tomatoes in boiling water for 1 minute. Drain and refresh in cold water. When cool enough to handle, slip off the skins. The green bell peppers are roasted to facilitate skinning them. While not strictly necessary, it’s nice not to have bits of the skin in every bite. Season the chicken pieces with salt and pepper and set aside. Roast the peppers over charcoal or a gas flame or under the broiler, turning them until they are charred on all sides. Remove them to a bowl and cover them. When cool enough to handle, peel off charred skin, using fingers or scraping with a knife. Discard stems and seeds. Rinse the peppers under running water. Tear or cut into bite-size pieces. Heat the oil in a large cazuela or deep sauté pan. Brown the chicken pieces on a medium heat, about 15 minutes. Remove them and reserve. Add the onions and garlic to the pan and sauté them for 5 minutes. Raise the heat and add the peppers and sauté a few minutes longer. Add the eggplant and zucchini, if using. Then add the chopped tomatoes and cook on a high heat 5 minutes. Stir in ½ teaspoon salt, cumin seed, and vinegar. Return the chicken pieces to the pan. Cook, uncovered, on a medium heat, turning the chicken once, until vegetables and chicken are very tender, 40-60 minutes. Eggs poached in tomato sauce need bread or toast for dunking. Quickie Tomato Puree. Cut the tomatoes in half and grate them on the coarsest side of a box grater. Collect all the pulp and juices. Discard the flattened skin--which also serves as a shield for your knuckles! You will need about 1 1/2 pounds tomatoes to make 2 cups of grated tomato pulp. Serve the eggs with plenty of fresh bread for dunking or spoon them over toast. Heat the oil in a large skillet. Add the tomatoes and season with ½ teaspoon salt and pepper. Cook on high heat for 1 minute. Lower heat to medium and cook tomatoes 10 to12 minutes. Quite a lot of liquid will remain. Remove from heat. Lay the slices of cheese on top of the tomato purée. Divide the ham, if using, into 8 pieces. Place them on top of or between the slices of cheese. Break the eggs, one by one, into a small cup and slide them into the pan on top of the cheese. Sprinkle with ½ teaspoon salt and the pimentón or cayenne. Cover the skillet and place on a high heat for 1 minute. Reduce heat to medium and cook gently until whites are just set, but yolks still runny, 6 to 7 minutes. Allow to stand 1 minute before serving. 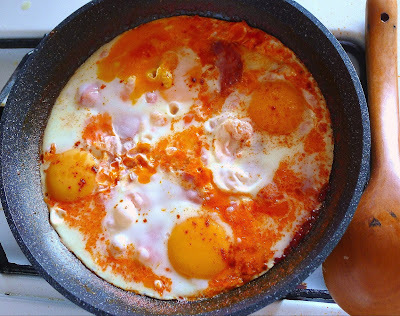 Use a ladle to lift eggs, cheese, and tomato sauce out of the skillet. Serve in shallow soup plates. Quick to assemble--use cooked rice for the stuffing and add chopped peppers and olives. 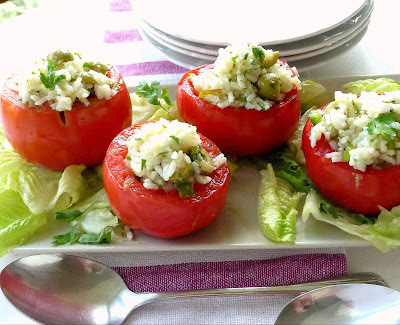 Tomatoes are also good stuffed with ensaladilla rusa, potato salad with carrots and peas (that recipe is here .) 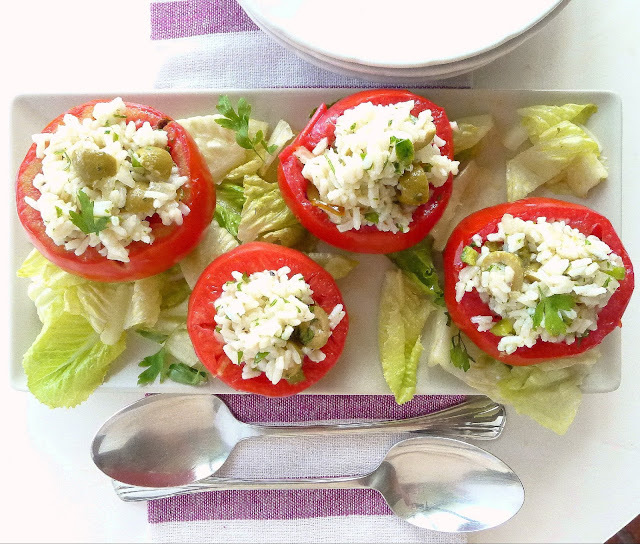 For a hot version: stuff hollowed-out tomatoes with leftover paella rice. Bake until heated through. Serves 6 as a starter. In a bowl combine the rice, onion, green pepper, garlic, parsley and olives. Season with 1 teaspoon salt or to taste and pepper. Add the oil and vinegar and toss the rice to fluff it. If desired, add a little olive brine or tomato juice to loosen the rice. 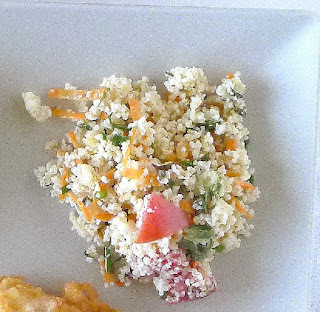 Place the tomatoes upright on a serving dish and spoon the rice salad into them, mounding it slightly. Here’s the third “flash-in-the-pan” menu. I actually did all three meals in the first week, when I had plenty of time to devote to them. 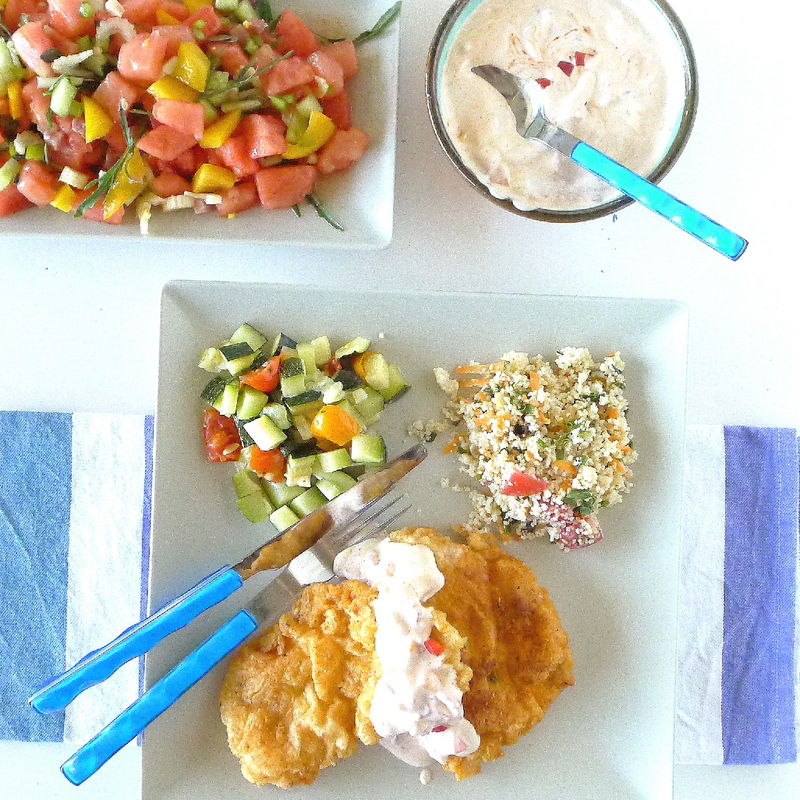 Yes, the foods are quick to prepare, but the photographing takes me a lot of time! So I’ve got two weeks of blogs with only a little recipe writing to do. 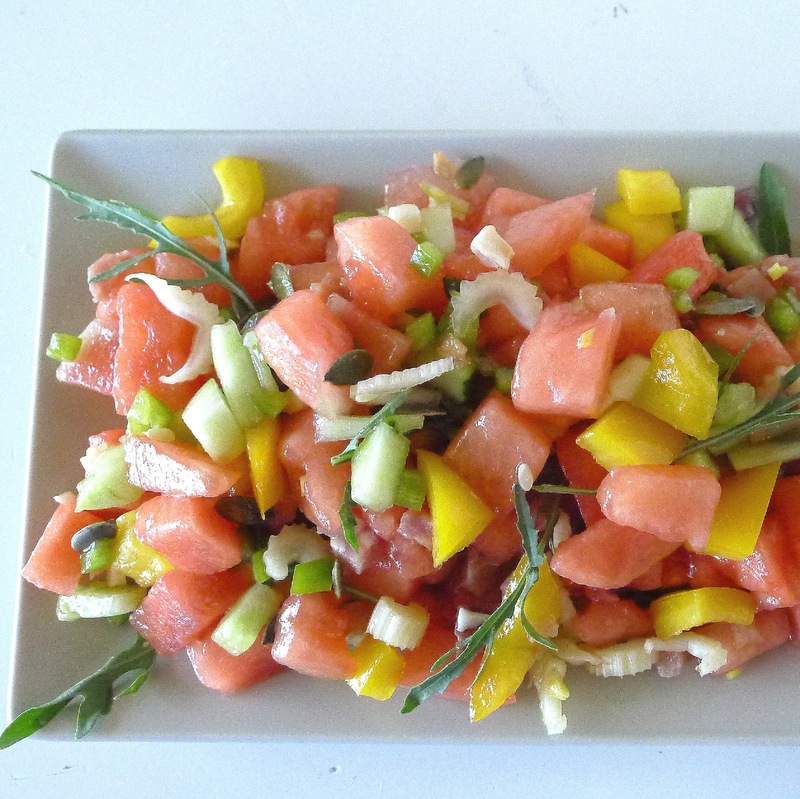 Dinner in 45 minutes: Starter of Watermelon Salad. Fried chicken cutlets with red pepper mayo; sides of microwaved zucchini and cous cous taboulleh with mint and carrots. I have to admit that I didn’t get this menu done in the 30-minute time limit I set for my “fast food meals.” That’s because I fried the six chicken cutlets in two batches. Never mind. Forty-five minutes is still pretty quick. Start with the Cous Cous Taboulleh. Cous cous is my go-to grain when I want a really quick side dish. Just pour boiling water over it and let set a few minutes. Season any way you like and it’s ready to serve, hot, room temperature or chilled. Ready, set, cook! Ingredients prepped for a meal ready in 45 minutes. Make the Microwave Zucchini and Cherry Tomatoes. The microwave zucchini is another quickie recipe ). Dice the zucchini, halve the tomatoes, microwave 3-4 minutes. Salt the vegetables after they have been microwaved. 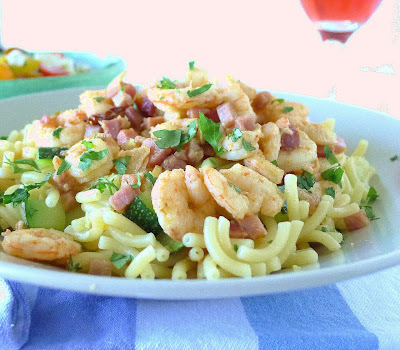 (recipe is here along with some other fast-food ideas.) This vegetable side doesn’t have to be served hot—it’s just as good room temperature. 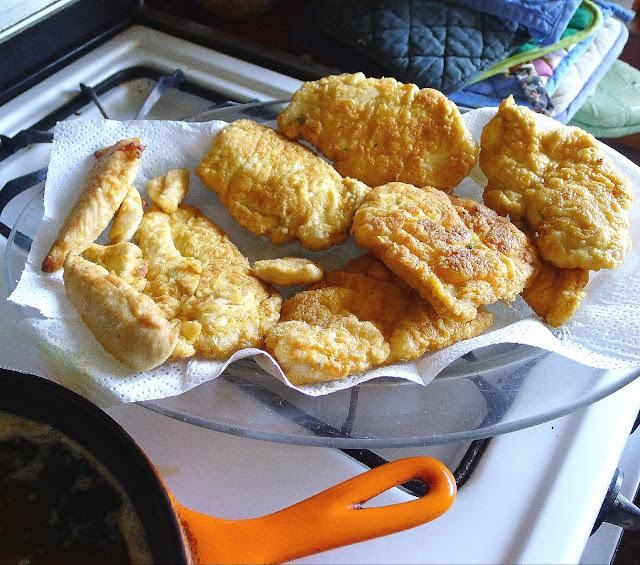 Bread the chicken cutlets and fry them. Dip them first in seasoned flour, then egg, again in flour. Fry them on medium-high heat until browned. Make the salad while chicken is cooking. Cut up the watermelon, cucumbers, celery and peppers for the salad. Make the sauce for the chicken. Just stir all the ingredients together. Cous cous is a pre-cooked grain, so it's ready to eat in minutes. Place the cous cous in a heat-proof bowl with the oil and salt. Add boiling water, stir, and cover the bowl. Allow to set 10 minutes. Fluff the grain with a fork. Add carrot, scallion, tomato, mint, parsley and lemon juice. Stir to combine. Serve room temperature or chilled. Juicy chunks of sweet watermelon, crisp celery and peppers, Sherry vinegar and olive oil. No, those aren't watermelon seeds--they are crunchy toasted pumpkin seeds. The salad can be made in advance and chilled. The salt will draw out the juices from the watermelon, so use a slotted spoon to serve the salad. Slice the watermelon ¾ inch thick. Lay the slices on a cutting board and cut away the rind. Cut the slices into ¾-inch strips, pushing aside any seeds. Cut the strips into dice. Place the diced watermelon in a bowl. Add cucumber, celery, green and yellow bell pepper and ham, if using. Season with salt and pepper, vinegar and oil. Stir in the pumpkin seeds. Serve immediately or chill the salad, covered, for several hours. 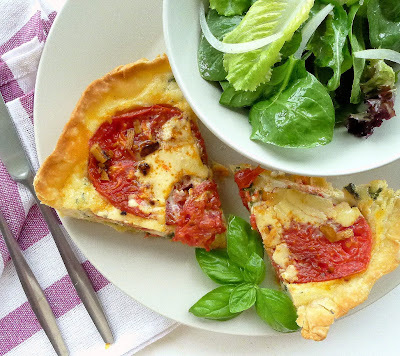 Serve with arugula. 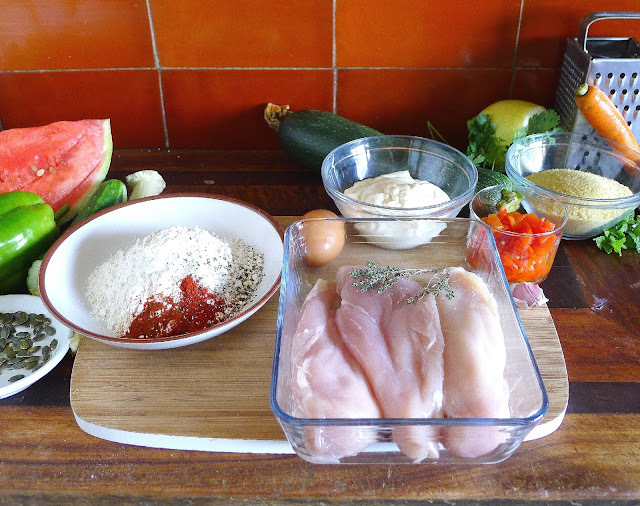 Chicken breast cooks in the time it takes to fry the cutlets golden-brown. Serve it hot or cold. Combine the flour, salt, pepper, thyme, pimentón and pimentón picante in a shallow pan. Beat the egg and milk together and place in a shallow bowl. Dip each cutlet first in flour, then in egg and again in flour. Place skillet on medium-high heat with enough enough oil to completely cover the surface. Fry the cutlets, turning them once, until they are golden-brown on both sides, about 5 minutes. Remove and drain on paper towels. 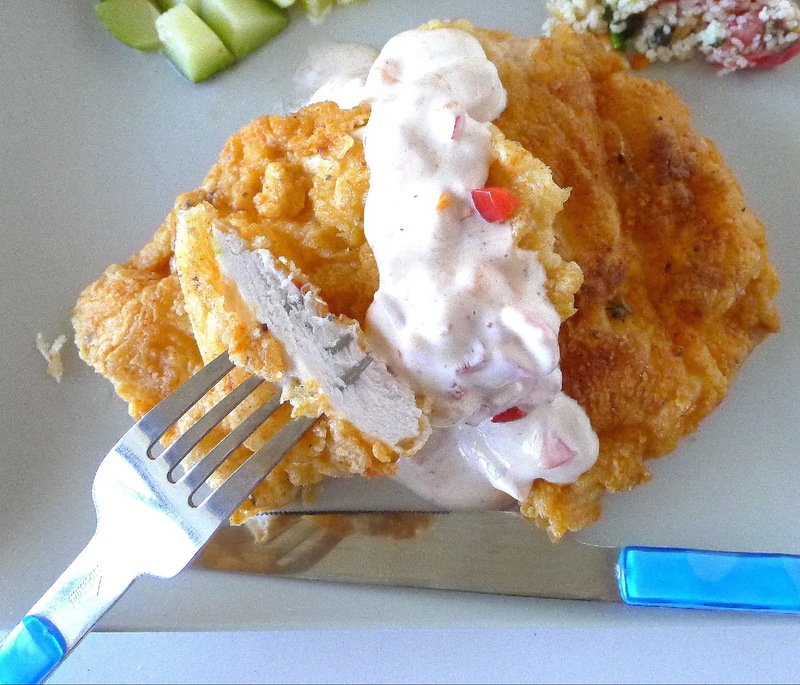 Serve hot or room temperature accompanied by the red pepper mayonnaise. 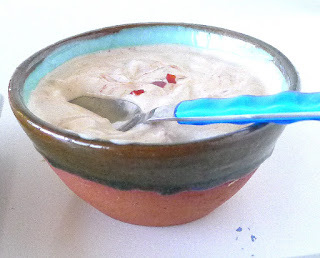 Mix bottled mayonnaise with chopped peppers, olive oil and hot harissa paste. Ready in a flash! Use canned piquillo peppers (drained) or any roasted and peeled red pepper. Harissa is North African red chile paste. It adds spice to the mayo. Whisk together the mayonnaise, peppers, garlic, oil and lemon juice. Swirl in 1 or 2 tablespoons (to taste) of hot harissa. 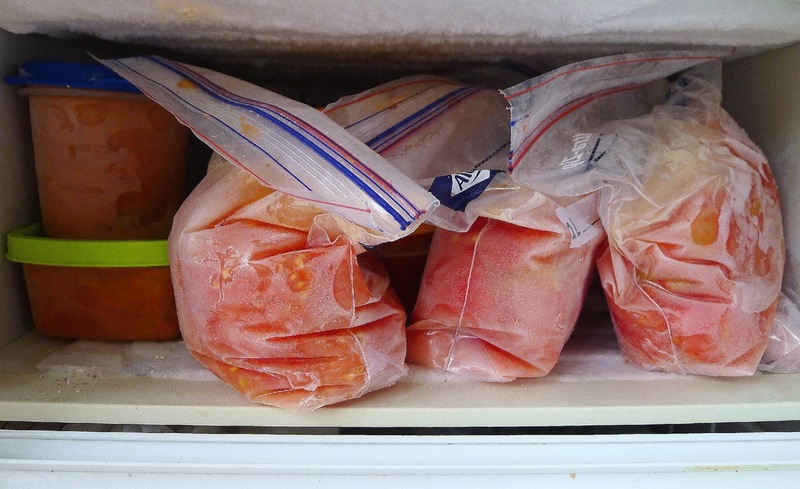 Store sauce chilled. Whether you’re busy with a summer project, working on a sun-tan, still enjoying vacation leisure or, groan, getting ready for a new school year (not in Spain, where the school term doesn’t begin until mid-September), August is no time for spending long hours in the kitchen. I’m touting fast foods for summer, with menus that are a “flash in the pan.” See last week’s posting for tips and Menu #1. Here’s Menu #2, ready in 30 minutes. Ready in a flash! 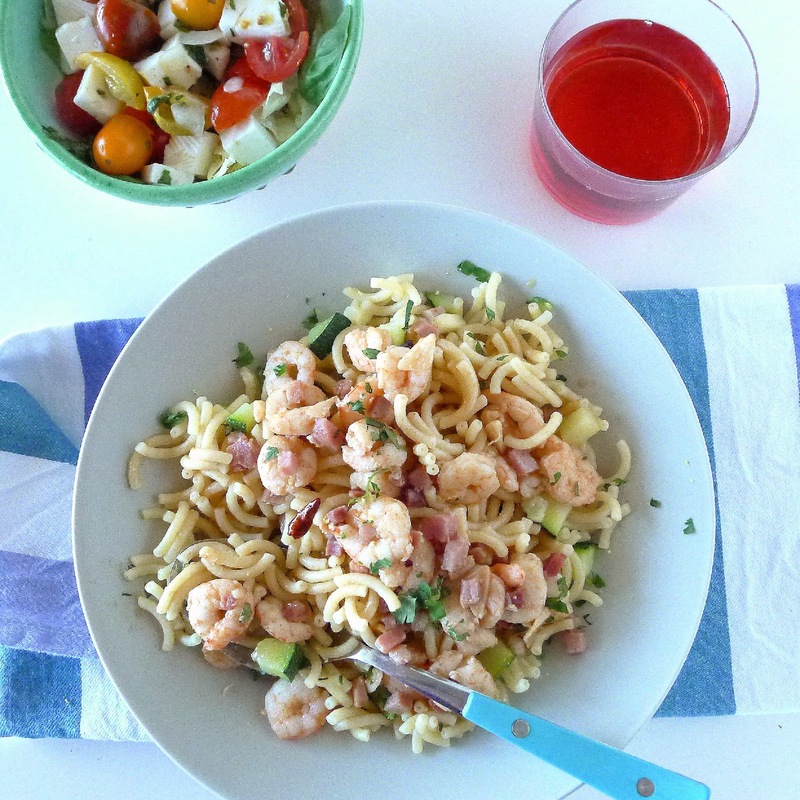 Tomato-cheese salad and pasta with sizzling shrimp, garlic and chile. Someone please pour the cook a glass of chilled rosado. Ingredients for salad starter and main of pasta with shrimp and zucchini. This main dish is inspired by a favorite Spanish tapa—gambas al ajillo (called gambas al pil pil in Andalusia), shrimp sizzled with garlic, served in tiny cazuelitas with chunks of bread for sopping up the delicious garlicky oil. It’s absolutely only a tapa or, at most, a starter. But, spoon those sizzling shrimp over pasta and they make a terrific main. I bought a bag of multi-colored cherry tomatoes at the market, and combined them with fresh goat cheese for a salad-starter. I don’t like vinegar with fresh tomatoes, so there’s no need to make a dressing. 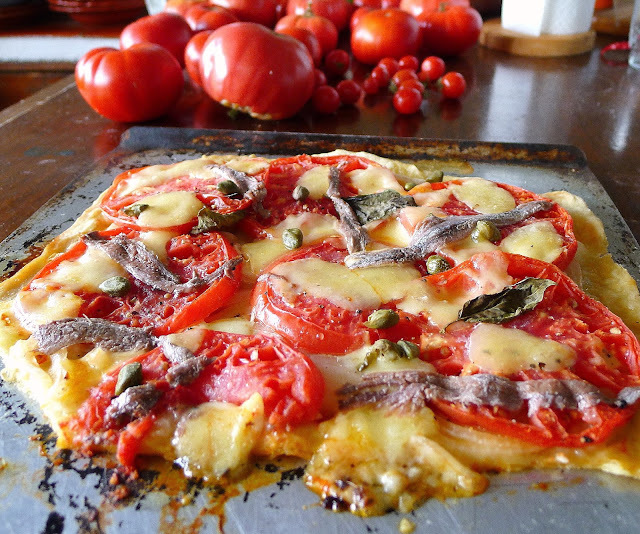 Just drizzle the tomatoes and cheese with extra virgin olive oil and plenty of salt. 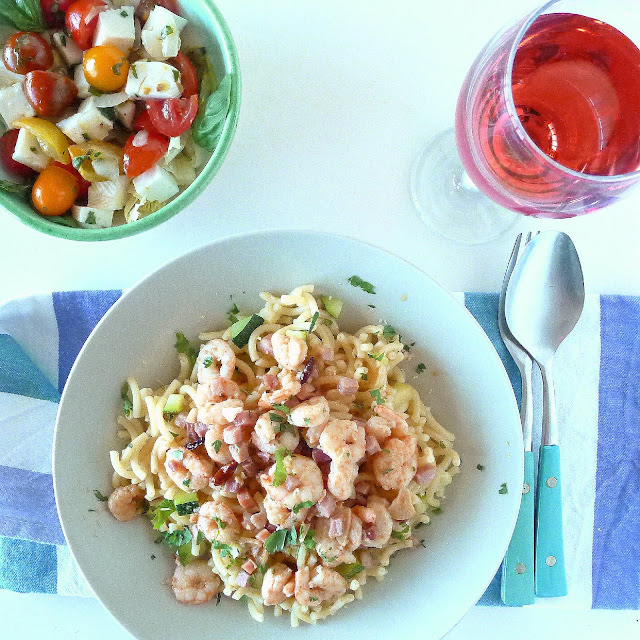 Finish it with chopped fresh basil, chopped mint or parsley. 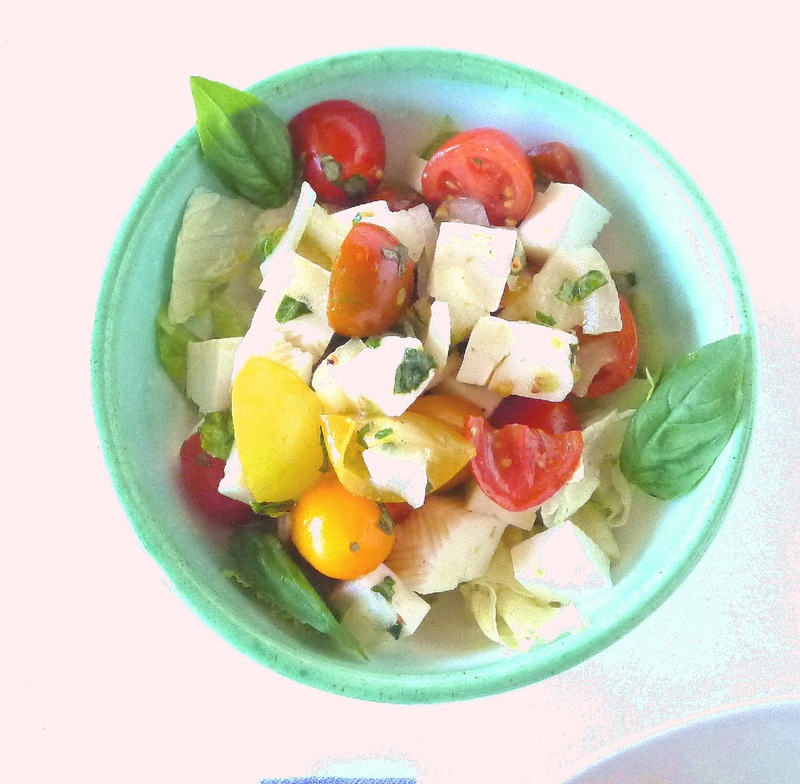 Cubes of fresh goat cheese, cherry tomatoes and extra virgin olive oil. Pretty simple. Queso fresco de cabra is a fresh, mild goat’s cheese. It is soft, not creamy, firm enough that it can be cut in dice. If not available, feta or mozzarella could be substituted. Quarter the tomatoes and place in a bowl. Add onion, goat cheese, salt and pepper and olive oil. Immediately before serving, stir in chopped basil. Serve on salad greens. This pasta, called fideuá, has pinhole through it. I’ve used a cute pasta called fideuá, short curls with pinholes. 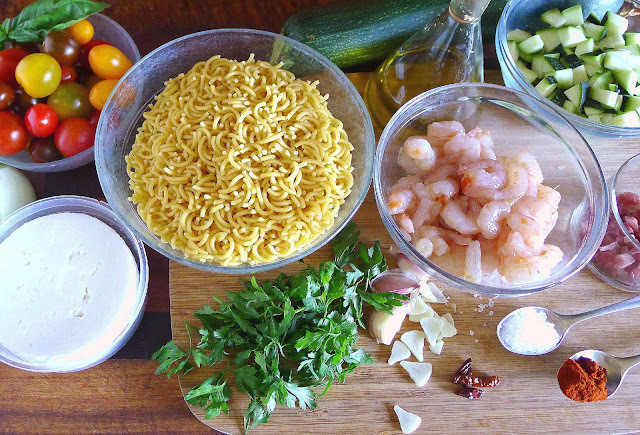 You could use spaghetti or linguine cut into short lengths. Once you’ve got the water boiling for pasta, add some vegetables, such as diced zucchini, to cook with it. Use tiny bird chiles whole or slice larger red chile crosswise. Or just use red pepper flakes. Add the salt to a pot of water and bring to a boil. Add the pasta. Cook until it is nearly tender, 4-5 minutes. Add the diced zucchini and cook 1 minute longer. Drain, saving ¼ cup of the hot pasta water. While pasta is cooking, heat the oil in a skillet. Add the sliced garlic and cook until garlic just begins to turn golden. Do not let it brown. Add the chile, shrimp and ham, if using. Stir-fry the shrimp on high heat until they are just pink and curled, about 3 minutes. 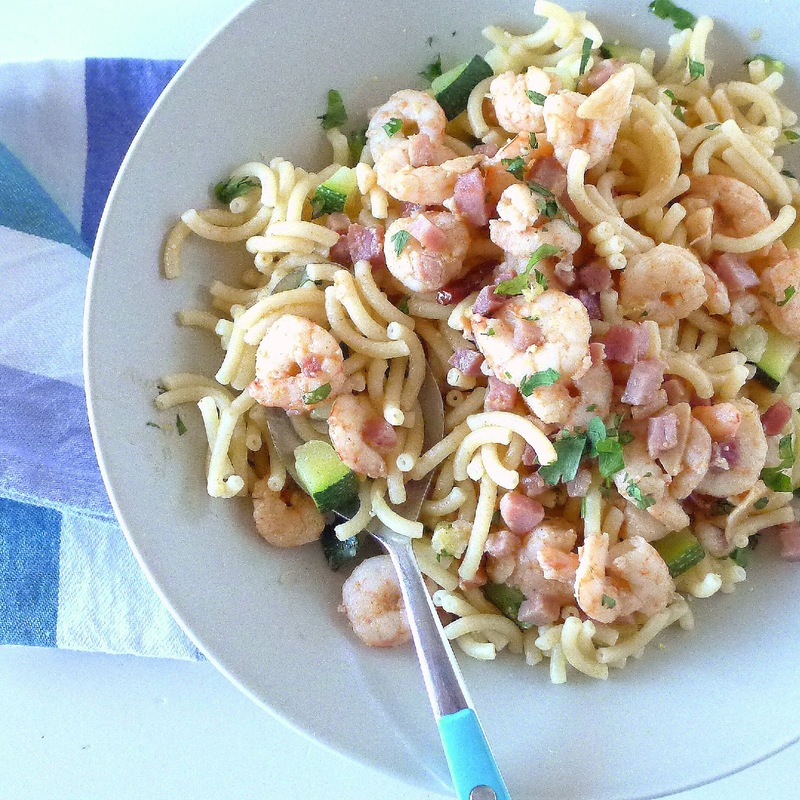 Skim out the shrimp and reserve them. Remove skillet from the heat. Stir in the pimentón. Add the wine and return to cook 1 minute. Add the pasta water. Bring to a boil. Return the shrimp to the skillet and remove from the heat. Serve the pasta and zucchini with the shrimp and garlic juices spooned over them. Grate lemon zest on top. Sprinkle with chopped parsley. The sauce comes together from the garlicky cooking oil, a little white wine and some of the hot pasta cooking water.